A régime born from defeat. 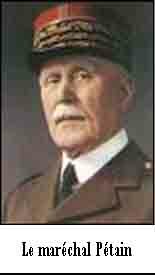 In World War II, a defeated France was under the control of the elderly Marshall Pétain (aged 84 in 1940) from July 1940 to August 1944. Running government from Vichy, he wanted to get the country back to work after the defeat. How could be rebuild a nation which was, in fact, conquered and under the control of Germany? The German attack on 10th may 1940 took the French army by surprise. En June, a general retreat was ordered. There was total chaos. 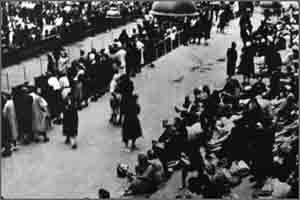 Under German bombing raids, it was like the Exodus, millions of French civilians as well as soldiers fleeing South on the roads. 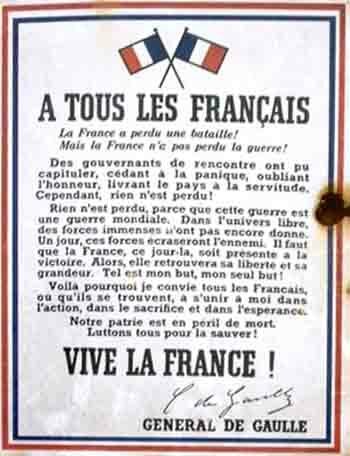 In a speech on the radion on 25th June 1940, Marshall Pétain announced to the French that he had asked for an armistice. France would have a government and keep its empire, but the country would be divided into two parts: the North (55% of the country) would be occupied by the Germans, the South would remain a free zone. Alsace and Lorraine would be reunited with the Reich. France in 1942. 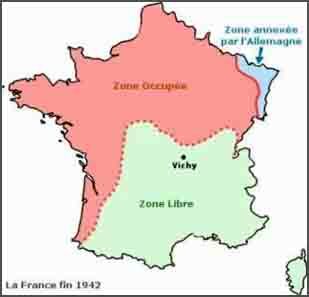 The Occupied Zone is red, the Free Zone (called the Vichy Zone) is green. The Blue Zone is Alsace and Lorraine, annexed by Germany. In London on 18th June, Général de Gaulle launched an appeal for resistance on the BBC radio. Once in power, Pétain wanted to restore the state's authority and set the country back to work. He rejected the tradionnal republican motto of: "Libery, Equality and Fraternity" as well as democracy, through banning the right to vote and political parties. France had to turn towards traditional values: patriotism, family, the Church. "Work, Family, Motherland" was to become the new regime's motto. Women had to stay at home to bring up their children; Mother's Day was created, and women who had large families received medals. French people were asked to turn back to the Catholic Church. In shcools, children participated in Youth Camps, or they received a heavily sports biased education which was also patriotic and moral. In addition, a real personal cult was developed around the Marshall . Songs such as: « Maréchal, nous voilà ! », (Here we are, Marshall! ), portraits in every classroom, etc. Right from the beginning, the regime abolished the liberty of the press and the right to strike, and forbad political parties and unions. The former leaders of the Republic (before the Fall of France), Leon Blum and Edouard Daladier were arrested, accused of not having prepared Frnce for war and they were condemned to life imprisonment in 1942. 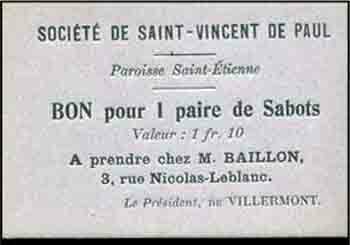 In October 1940, Vichy introduced laws which struck agains Jews, Free Masons, Communists and Gipsies. In 1942, Jews had to wear the yellow star. 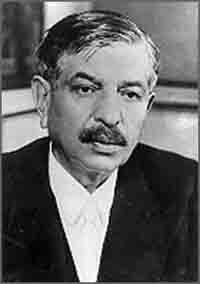 Pierre Laval was seen to favour the Germans and he led the French government from the beginning of April 1942. He increased initiatives to please the Fuhrer. Germany needed labourers, so Laval sent three French workers to Germany for each French prisoner that was set free. In 1943, he introduced compulsory Work Service . Policies against the Jews became persecution. The French police helped the Germans to hunt down Jews (for example, the Raid of « Vel' d'Hiv' » of 16th and 17th July 1942), Free Masons and foreigners. Le Vel' d'Hiv ...à droite. These people were taken to internment camps before being sent to concentration camps. Of the 300,000 Jews living in France in 1939, 75,000 were deported. For most French people the daily preoccupation was how to find food, which was severely rationned. Consumer goods became more and more difficult to find. Vouchers, like the ones below, enabled people to obtain the rationned goods. 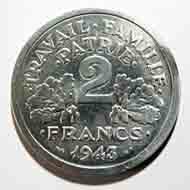 On the 2nd June 1944, General de Gaulle proclaimed a provisional French government. 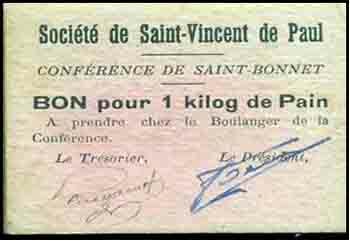 On this date, the Vichy regime came to an end. In August, Pétain, Laval and several others were taken away by the Germans in their general retreat from France back to Germany. In France, during the summer of 1945, "The Purge" was organised. Collaborators were hunted down and a good few were executed without trial. Pétain who had returned to France, was condemned to death but this sentence was commuted to life imprisonment. Laval, along with other collaborators, was executed. It has needed time for French people to reconcile themselves to this very black period of their hsitory. Marshall Pétain was 84 when he became leader. He was a hero from World War 1 (1914-1918). Faced with a desperate situation at Verdun, he had inspired his troops not to surrendur. Trough a miracle, his troops had held their positions, a victory which many had believed impossible. The majority of French people saw him as a national hero. Pétain thought that a return to traditionnal values would help to create a sort of unification among French people in their defeated country. He replaced the traditonal motto of "Liberty, Equality, Fraternity" with "travail, famille et patrie" or "Work, Family and Country". Coins were minted carrying these words as above. A perosnal cult developed around the Marshall. Below is one of the propaganda songs, which were sung by schoolchildren at the time. In April 1942 Pierre Laval took over the government. He was pro-Nazi and introduced many measures of exclusion. The cyletrack of Drancy is located near Paris. 13,000 Jews (including 4,000 children) were taken here after a set of raid. They were all sent to concentration camps. Today, this raid is regarded as one of the worst in the war in France. After the Allied Landing in Normandy (6th June 1944) the regime undertook reprisals against the Resistance. On the 10th June, the SS massacred the whole population of the village of Oradour-sur-Glane (642 men, women and children). 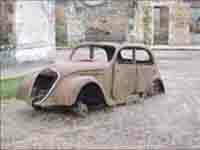 Oradour - the doctor's car. The doctor was out doing his rounds during the raid. When he came back, he was taken by the Nazis, lined up along with his family and shot. His car still remains in exactly the same place as he left it.